Asar-i-Sharaf. Fine verandah 33 ft x 120 ft, roof supported by four massive wooden pillars, fine reservoir in front 25 yds x 60 yds. [Bijapur]. bl.uk > Online Gallery Home	> Online exhibitions	> Asia, Pacific and Africa Collections	> Asar-i-Sharaf. Fine verandah 33 ft x 120 ft, roof supported by four massive wooden pillars, fine reservoir in front 25 yds x 60 yds. [Bijapur]. 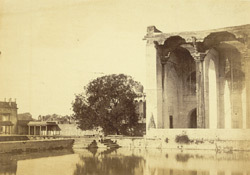 A photograph of the Asar Mahal in Bijapur from the 'Vibart Collection of Views in South India' taken by Henry Hinten about 1860. By far 'the best-preserved Adil Shahi palace at Bijapur is the Asar Mahal east of the citadel walls. This is connected with the innermost zone by a bridge, only portions of which survive. Originally used as a hall of jutsice known as the Dad Mahal, the building was converted in 1646 into a sacred reliquary to house two hairs of the prophet, thereby ensuing its preservation through the centuries. Its eastern front consists of a double-height portico with octagonal timber columns carrying a wooden panelled ceiling, probable all replacements. Chambers to the rear are arranged around halls on two levels. Portions of the murals with which the interior was furnished are preserved; so too the elaborate inlaid doors and screens'.